In clicking around Frederick’s site, I discovered you can order giclee prints of his work, for a few hundred dollars apiece. It’s heartening to see an accomplished, successful artist of his stature doing this, despite the long-standing prejudice against these prints in the art world–partly because many lesser galleries push them as if they were the equivalent of woodblocks, serigraphs or lithographs. They aren’t, but in my view, reproductions like these serve as a genuine way to connect with people who love the work but can’t afford the original. Offering reproductions on archival paper this way ought to become commonplace. In this economy, the people who would identify the most with the world Frederick depicts could hardly afford one of his actual paintings: there’s a sort of justice in making the next-best-thing available to at least some of them. Real recognize real, as they say. You have a couple more weeks to see a marvelous invitational show at Main Street Arts. It includes work from eight artists working in the Rochester/Finger Lakes region. The work is consistently great and often surprising in a way that makes you keep coming back to look at many of the paintings. I’m proud of the work of a few of my friends in this one: Tom Insalaco’s consistently mysterious and usually dark portraits and figures in his contemporary baroque style; Jim Mott’s night paintings, brilliant, quickly executed grisaille studies full of feeling for nature and a hint of spirituality; and Chris Baker’s increasingly masterful gouaches from Scotland and many other places. One of his paintings, Skye, below, was my favorite in the show, and I’m eager to see his two-person show with Jean Stephens at Oxford Gallery soon. Kurt Moyer’s big representation of a forest floor works as all-over abstract, the way some of Welliver’s denser forest interiors do, with a sumptuously handled surface. 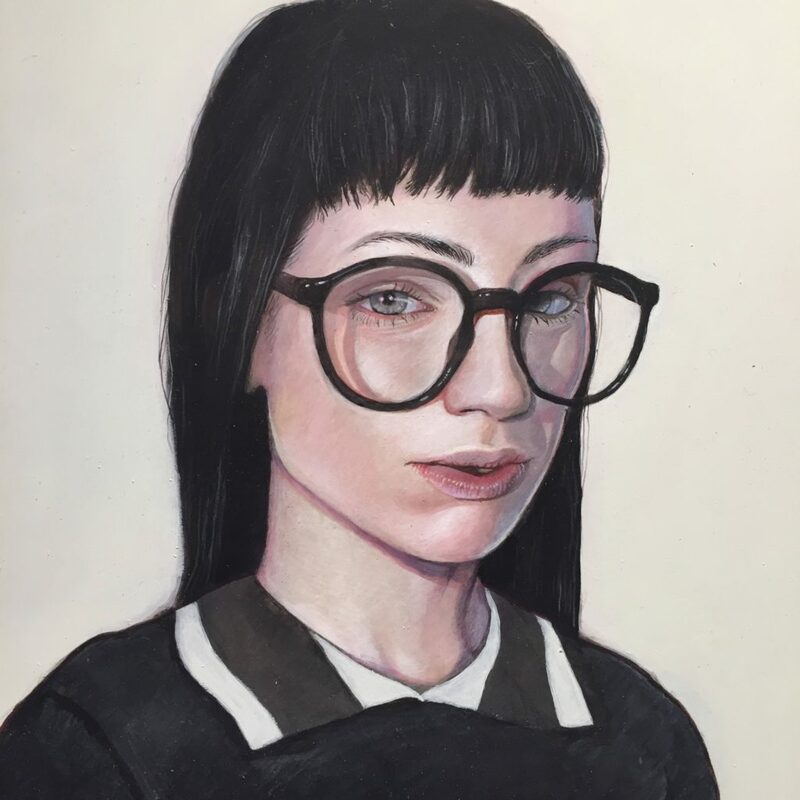 Mike Tarantelli’s small portraits reminded me of early Lucien Freud before he started troweling on the paint like a possessed mason in his signature way, back when he was doing those ultra-sharp faces and figures, whose precision looked almost imaginary. There’s also great work from Belinda Bryce, Lacey McKinney, and Sarah Sutton. Everything is fresh and sometimes startling in its immediacy. I love Main Street Arts. 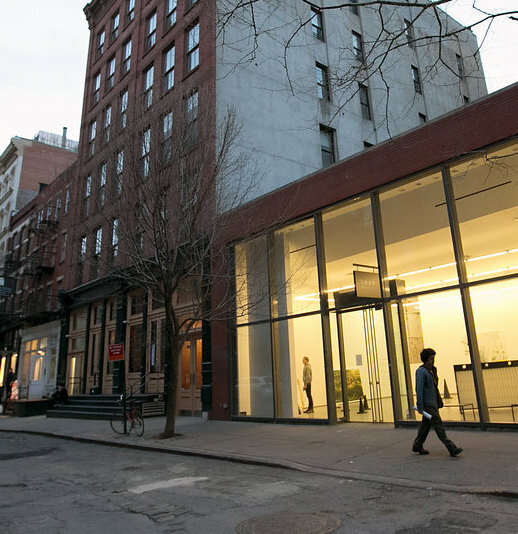 It’s a good friendly space, bright, with big storefront windows and plenty of room for larger work and fresh intelligence in its curating. The show ends Oct. 6. There’s another week left in a show of small works by Christopher Burke, in Columbus, Ohio, at Brandt-Roberts. These carefully constructed urban nightscapes often have a dumpster or trash receptacle serving as fulcrum for everything else in the picture. In his choice of subjects, Burke has taken to heart Charles Hawthorne’s advice to go paint the train station. He paints the spot few others would stop to appreciate and makes it a source of pleasure. These paintings remind me of a variety of other work, in the best way possible–he’s assimilated his influences without being derivative. Matthew Cornell’s show not long ago at Arcadia, when it was still located in downtown Manhattan, depicted maybe a slightly earlier hour of twilight that bathed his assiduously realistic paintings of homes he’d inhabited throughout his life. 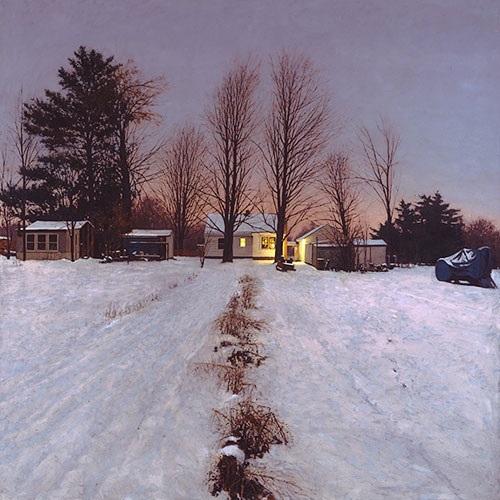 As do Linden Frederick’s popular scenes of dusk. Burke favors the same crepuscular glow, the sky slipping into sleep mode, with artificial lamps already burning in back streets. Yet his images are astringent, abstracted and minimal, structured into grids of crisply delineated form. His palette is severely disciplined, pared down to a very basic range of hues, both in these and his usual oils of buildings in the daylight hours. Yet the emotion these gouaches evoke works like a faintly heard melody, their soft illumination pushing back against the quiet emptiness of deserted alleys and streets. Sometimes one of the skies in these paintings on paper suggests the light of the city itself shining up and then banking down off the clouds. It’s the light you see and love along with the bittersweet ache of solitude when walking home from a pub, with more than a bit of a buzz, at 2 a.m. (Those were the days.) It’s a world without human figures, everyone inside or else on the other side of town, a few windows shining with hints of routine domestic mysteries hidden behind those walls. 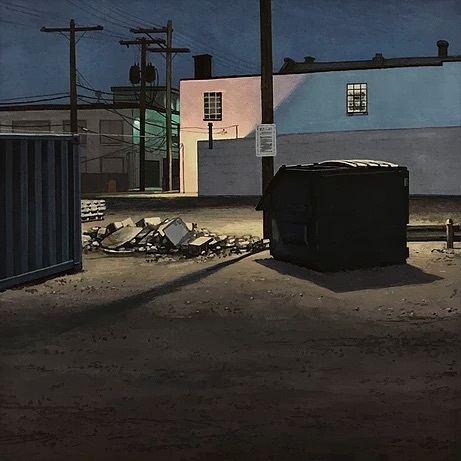 What I love most about this series are his dumpsters and trash bins, the least picturesque subject one could pick at that hour, loved only by those who search for ways to survive another day by diving into them. The night gives Burke the ability to push his geometric bent even further toward abstraction in the way light falls and the shadows cut on the bias across a wall. There’s nothing here with a dimension larger than 16 inches and the smallest painting is 5″ x 7″, which is miniature to me, and yet the scale doesn’t diminish his ability to suggest detail and give his scenes the crisp definition reminiscent of Sheeler’s more representational paintings. But his mood is closer to Hopper, and even to the American Scene paintings from his fellow buckeye, Burchfield. Amazingly, he not only has this solo show of more than twenty paintings up now in Columbus, his two-person show in Chelsea at George Billis will open on Nov. 7. In 2015 we were excited to announce that the annual Manifest Prize (ONE) award was increasing to $5,000. This concretely underscored our non-profit organization’s strong desire to reward, showcase, celebrate, and document exceptional artwork being made today, and to do this in a tasteful non-commercial yet very public way. Further, the Manifest Prize is intended to incentivize and support the creation of excellent work into the future. 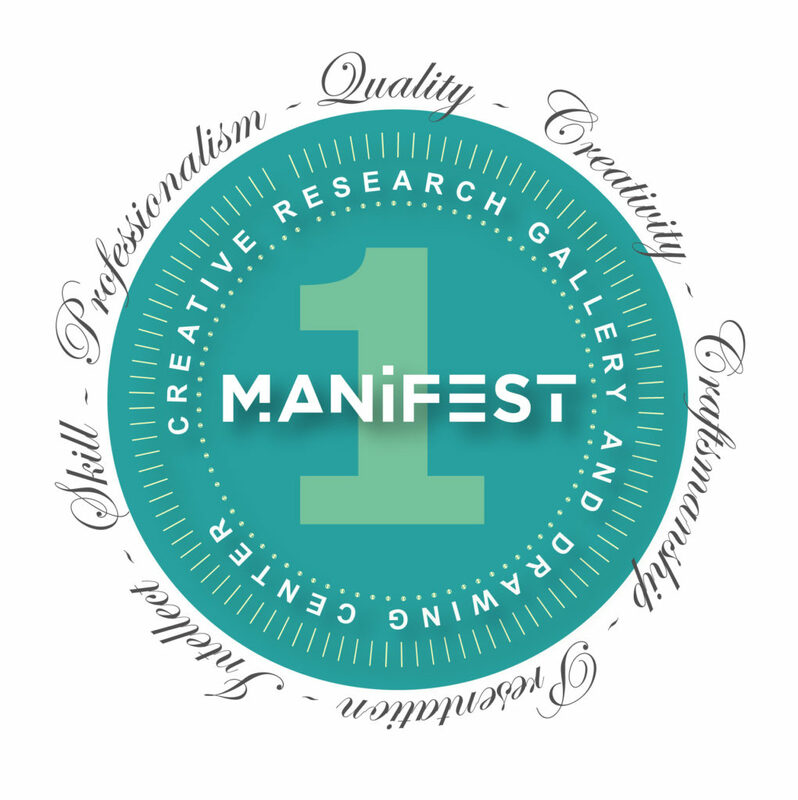 Manifest’s mission is centered on championing the importance of quality in visual art. This project is one aspect of the realization of that mission and we are happy our board of directors has approved the continuation of the significant award amount. The entry process for the 8th annual Manifest Prize award (and ONE exhibit) is now open. There are no restrictions on submissions to The Manifest Prize. Artists who have submitted to or been included in previous Manifest projects are welcome to submit to any future project, including the Manifest Prize. Works submitted must have been completed within the past five years (2012-2017 for the 8th Manifest Prize). IMPORTANT! Works submitted MUST be available for the exhibition period of early December through mid-January in order to be eligible for the prize. 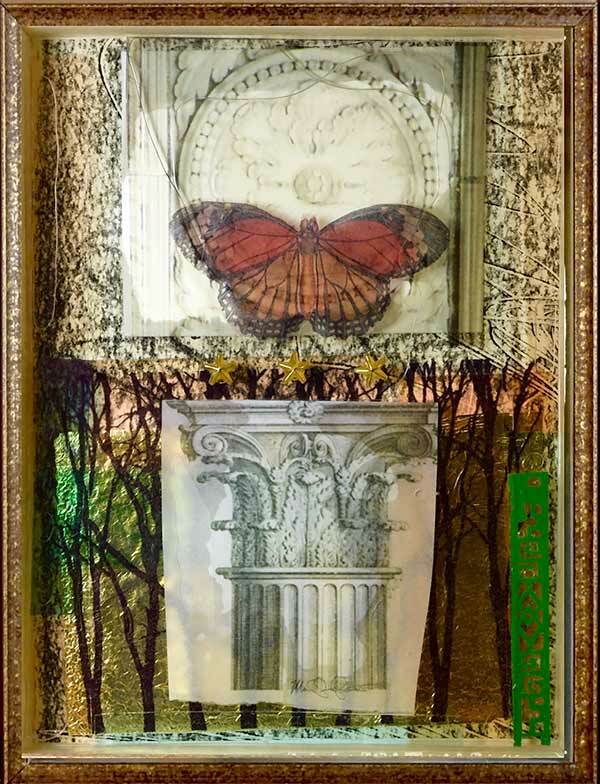 Submission constitutes a formal agreement to provide the work for exhibit should it be selected. Jury Process: Manifest’s normal selection process involves a complex two-part system. This exhibit will be juried by an anonymous 7-15 member panel of professional and academic advisors with a broad range of expertise from across the United States. Because of the nature of this project, works approved by the first jury will be passed through a second, and possibly a third jury round, with jurors being shuffled from round to round. The work receiving the highest average score will be awarded the prize. The ten next highest scoring works will be the semi-finalists. Juror comments will be posted in the gallery and in the Manifest Exhibition Annual publication. In addition to the cash prize and solo feature gallery exhibit at Manifest Gallery in Cincinnati, the prizewinner will have multiple pages devoted to their winning work in the season-documenting Manifest Exhibition Annual (MEA) hardcover publication, including artist’s statement, bio, and jury statements. The ten semi-finalist works will be included in the MEA as well. The economy has been stagnant for the vast majority of people for decades now—wages have stalled since the mid-70s, as profits and productivity have never stopped climbing. This long-term decline has been disguised by the dot.com mania and the real estate bubble, and the current, overheated stock market. As people point to traditional, superficial indicators of growth, and the media fails to explore what’s actually happening economically for most people. This makes it hard to connect the dots and understand why many galleries are struggling and some going under. It seems only the wealthiest have money to spend on art, and most of it is going to the highest end—in other words, the “brand” mentality governs spending, with people buying work at higher-priced work that seems more assured of rising in value. The dubious assumption behind all this is that the current art market actually prices work according to its actual value as art rather than as a predictable investment. Nan Miller recently announced she was finally, really, closing her gallery here in Rochester, NY, after years of appearing to be going out of business and selling work accordingly. For years now, the Oxford Gallery, where I exhibit, has been offering work at a discount during the summer in order to stimulate sales, and Jim Hall’s inventory of 19th century American art has become more difficult to sell in recent years. None of this has to do with the quality of the work itself. You are currently browsing the represent weblog archives for the month September, 2017.